The travelling exhibition ‘Antifascistas: British and Irish Volunteers in the Spanish Civil War’ opens at the 12 Star Gallery, 8 Storey’s Gate, London SW1P 3AT, on 5 May and runs until 14 May. The gallery is open daily, Monday to Friday, from 10am to 6pm. 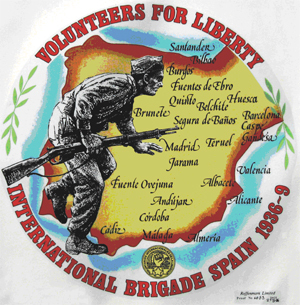 The exhibition and accompanying book tell the story of the 2,500 volunteers from the British Isles who joined the legendary International Brigades to defend democracy during the Spanish Civil War of 1936-39. Produced by the International Brigade Memorial Trust, ‘Antifascistas’ sets out the reasons why the volunteers took the extraordinary decision to risk their lives in a foreign war – in which more than 500 of them died. The role of the British Battalion in many of the key battles in Spain is described, along with brief biographies of outstanding individuals who took part. Also detailed is the heroic work of the medical volunteers in makeshift hospitals near the front line. In addition, the exhibition considers the cultural and artistic impact of the International Brigades and their historical legacy, underlining the importance today of remembering their example of international solidarity. Using many contemporary photographs and striking images, ‘Antifascistas’ brings to life the idealism, commitment and sacrifice of these exceptional men and women who served in the International Brigades and continued the fight against fascism during the Second World War and beyond. After its inaugural showing in London, the exhibition will be on display at Newcastle City Library from 22 May to 7 June and later in the year will travel to Manchester, Nottingham, Durham, Rotherham, Liverpool and London again. For further information, contact the IBMT.